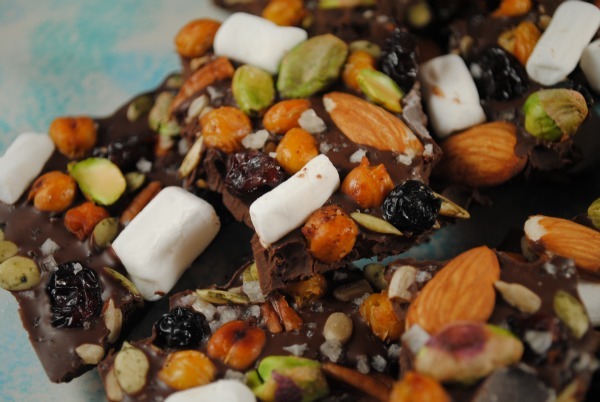 This Twisted Chocolate Bark recipe has a secret. It’s full of nuts, seeds and legumes! Yes I said legumes. I’ve been playing with different ways to use my Roasted Chickpeas in more ways than just eating them by the handful. Of course the hardest part is they are so amazing eating them by the handful you have to be intentional and set some aside for other uses. Or you can always make a double batch which is what I do. The great part about this recipe is there is no measuring. I know, blasphemy. How can you have a recipe with no measuring. Well trust me this will will work no matter what. How could it go wrong with chocolate as the base. The key is in the prep. You of course have to first make the Roasted Chickpeas. This is where you can really change up the flavorings of your Twisted Chocolate Bark by changing the seasonings you bake into the chickpeas. You can use just plain salt, maybe a little cinnamon, how about some cayenne pepper so your chocolate will have a kick. Maybe you want to toss it in a little cinnamon and achiote for that Mayan twist. I’ve used my Turkish blend as well and they tasted great on the chocolate. You can also use that same principal with what you add to the top of your chocolate bark. Think about your favorite combinations. You could use some of Ali’s Candied Walnuts or Hallie’s Spiced Maple Pecans instead of plain ones. 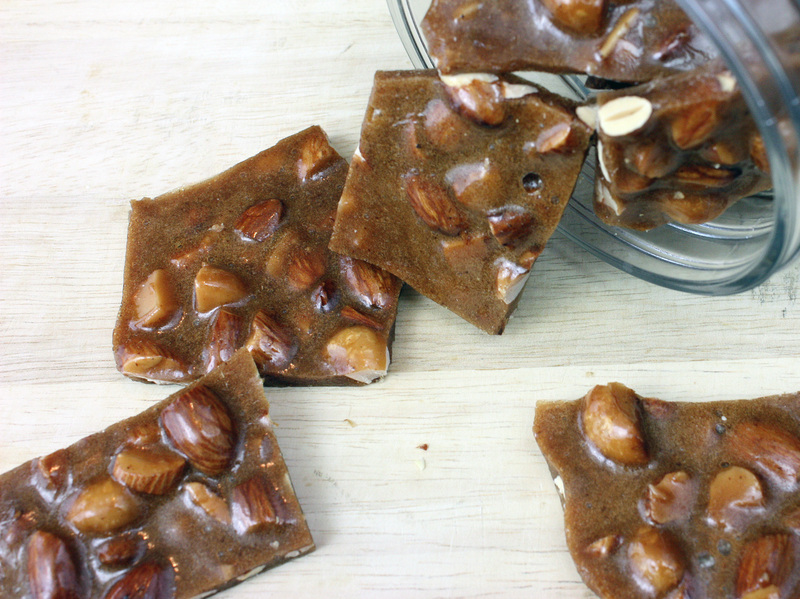 Maybe you want to drizzle a little honey (like the kind Shirley makes) on top or some gluten and dairy free caramel from Adventures of a Gluten Free Mom. If you like to make your own Home Made Marshmallows try Carol’s recipe from Simply Gluten-Free. Here is my Twisted Chocolate Bark that I made yesterday. The fun thing is, it’s never the same twice. You may not see all of these ingredients on this bark, but these are my favorite ones to use. Really, do you need directions? It seems silly to give directions to a non-recipe but I gave ingredients so lets keep it balanced. OK, melt the chocolate and pour it out onto parchment paper. Toss on your toppings, make sure you press them into the chocolate and then let cool to set up. Break up into pieces and then try not to eat them all at once. Good luck. 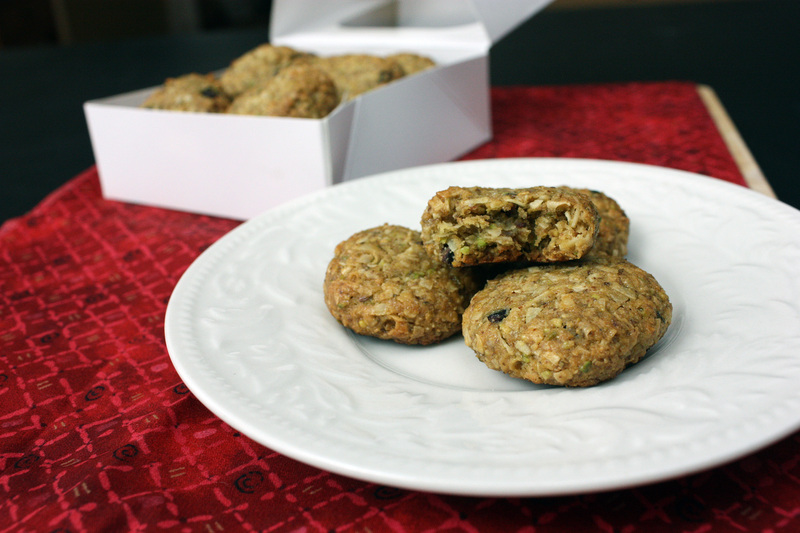 This recipe is being shared on Tasty Eats at Home as part of A Gluten-Free Holiday. You can gather and give your recipes for Gifts of Good Taste. There will also be lots of giveways so make sure you leave a comment on her post. 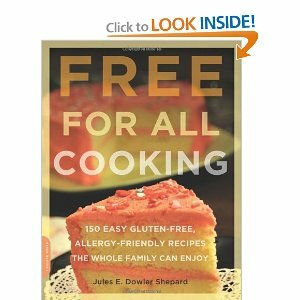 She’s giving away 5 copies of Free for All Cooking: 150 Easy Gluten-Free, Allergy-Friendly Recipes the Whole Family Can Enjoy and 2 copies of Artisanal Gluten-Free Cooking: More than 250 Great-tasting, From-scratch Recipes from Around the World, Perfect for Every Meal and for Anyone on a Gluten-free Diet–and Even Those Who Aren’t . Alta is sharing these two great looking gifts of Macadamia Almond Brittle and Pistachio Coconut Macaroons. After I had taken photos of my bark I just couldn’t decide which ones to share, so I thought I would share a few in this video. It’s paired with a favorite song of mine back from when I used to teach Jazzercise. Enjoy. This looks amazing! I will definately have to try this one!! Jenny- I hope you get to try some of this. Please stop back and let me know what toppings you added to yours. Hallie- Oh it's great to receive. I added in a link to your spiced pecans too. I think they would be great on top. LOL! I can so picture you teaching a class to this song. Did you wear the Jane Fonda leotard? This bark looks great. Another addition to the Christmas present arsenal for the teenage in-laws. They love it when I give them their own box of sweets. Oh, and a few pieces left for me. "Good luck" I like that. Tia- well you can only imagine what I used to wear to teach class. Often multiple pony tails, crazy outfits and you would never know what was next from me. I do miss teaching. Hoping to get back to it in the next couple of years. What could be better, talking the entire time I was doing something and telling them what to do. It was a blast. I actually owned the studio for a couple of years but had to sell it when I got sick. Fun times. If you get a chance you should listen to the whole song, it's a hoot. Oh, wow, Diane, this looks great! I have an arsenal of various dried fruits and nuts – this would be great! Unfortunately, I can't do chickpeas, but I'm sure it'd still be great if I roasted the nuts and salted/spiced them. This is a great last-minute, super-easy treat. 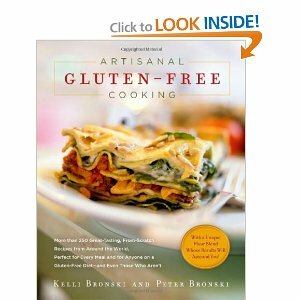 Thanks for linking up to GF Holiday! Oh you are one seriously insane lady! What a mix Diane. Chickpeas? Really? Alisa- don't knock it until you try it. It adds a wonderful crunch and of course lots of goodness! I LOVE it Diane!!! I have played the video about 22 times already, my 3 year old is getting his chocolate groove on, LOL! Thanks for the link love, can't wait to make some of this. Have you gone to a Zumba class? I'd like to go sometime. Roasted chickpeas to me are amazing treats. There is just so much to love about them. I'll be looking for more ways to use them. I love then in salads too. Better than croutons. Shirley- well you put that honey into those bottles for me to enjoy so that's making it for me. Oh and give those bees a hug for me too. Ricki- I'm so addicted to roasted chickpeas. I keep them on my counter top for snacking. They end up in lots of crazy places. I thought, why not chocolate? That is so enticing — and I love the music with it. If I make that, I'll certainly need some Jazzercise!